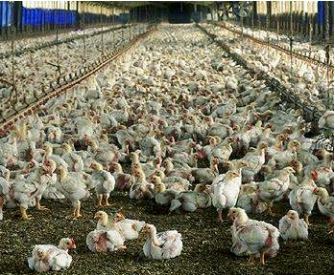 A staggering 640 million chickens are raised and slaughtered for their meat each year in Canada. Chickens raised for meat (“broilers”) have been so genetically selected for high growth rate they are now just 32-36 days old when slaughtered. But because their bone structure has not been able to adapt to their massive bodies, painful and crippling leg disorders are common in the birds. chicken’s beaks contain more nerve endings than our finger tips. The debeaked birds suffer phantom pain and some develop tumours of the beak as the nerve endings attempt to regenerate. As a by-product of the selective breeding for large size, breeding males may be hyper-aggressive and injure and terrorize the hens, who cannot escape from them in the breeder houses. Compounding the aggression, breeding roosters are often only given 40-50% of the food they require, making them chronically hungry. High levels of ammonia and dust in the sheds broiler chickens are raised in cause a build-up of peritoneal cavity fluid and respiratory disease. The ammonia dissolves on their mucous membranes and eyes, producing ammonium hydroxide, an acid that causes ammonia-burns. These ammonia burns and ulcerations also occur on the birds’ rears, breasts and feet. On the day of slaughter, the chickens are often brutally loaded by unskilled young men paid by the trailer-load, not the hour, encouraging speed over care of the birds. The birds are grabbed by their legs and carried, four per hand, then thrown into crates. Many birds are injured in the process with fractures to the legs and pelvis, hip dislocation, tendon or ligament trauma, hemorrhaging, detached femurs, ruptured livers, crushed heads and dislocated necks. While poultry are included under Canada’s humane transport and slaughter regulations, the chronic and severe violations occurring daily are not, and historically have never been enforced. Chickens are regularly overloaded onto inproper conveyances that do not afford them protection from the elements or enough headroom. The crate design is also improper, not allowing each bird to be accessible to be euthanized or removed should they become injured. The birds are also chronically overloaded, suffocating some to death. Broiler chickens awaiting in transport crates on the parking lot of a slaughterhouse. Because chickens are routinely loaded into broken crates, some fall out and are thrown onto busy highways where they are crushed by oncoming traffic. 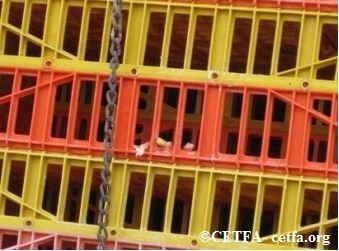 Chickens’ feet frequently become entangled in the mesh of the crates. When workers very quickly and roughly remove the birds to live-hang them, their enslared feet are forcibly amputated. One particular facility – Maple Leaf (Toronto, ON) – regularly had still-lodged, ripped off chicken feet left in their crates. Our inspectors documented the amputated feet at this location for over 3 years; each and every time we visited, we found at least one more foot. Ripped off legs in transport crate. Birds who have suffered an amputation are called “1- legged hangs” by industry. They are at high risk of falling from the metal leg shackles, and once on the ground are at enormous risk for abuse such as kicking, stomping and even as we were told by one Canadian Food Inspection Agency veterinarian, having workers force air compressors into their cloacas to blow them up. All chickens at the slaughterhouse are roughly live-hung, upside down by their feet. Many of the birds attempt to right themselves, but those that struggle are at greatest risk of further injuries, such as femur dislocation, which in a third of cases will be forced into the abdominal cavity. One study found a 44% increase in fractures from live-hanging. The birds who manage to avoid the stun bath by raising their heads will not be paralyzed, and when sent through the spinning neck blades may miss them – some partially, some fully. These birds do not bleed out sufficiently before being thrown into the scald bath where they are scalded alive. CFIA records indicate that over 250,000 birds die in this unfathomably cruel manner each year. The live-scalding of chickens is not only a massive welfare concern but has become a major food safety issue as well. A study in 2000 to determine the cause of the extraordinarily high rate of Salmonella bacteria commonly found on poultry carcasses found that 75% of scald tank water samples tested were salmonella positive. The salmonella was found to have been introduced through the excreta of still-live birds thrown into the scald tank. CETFA is calling upon the federal government to finally do what is right and begin enforcing the transport and humane slaughter regulations for chickens. All poultry are supposed to be protected against such cruelties, yet never are. We are also calling upon the broiler chicken producers to phase out cruel on-farm practices such as detoeing, debeaking, and dubbing of chickens. The poultry transportation and slaughter industry must also take responsibility and develop better methods of loading chickens onto trailers, protecting them during transport and ensuring they are able to stand fully as federal regulations dictate. And finally, slaughter plants must phase out the use of their cruel method of slaughter. Electric stun baths must be replaced by controlled atmosphere killing which uses nonaversive, inert gases (NOT carbon dioxide) to kill the birds while still in their transport crates, meaning less handling. The inert gas is quick and relatively painless – the birds do not pile or panic. Many companies are moving to this much more humane method and even entire countries have made the electric stun bath illegal, recognizing the unnecessary cruelty it inflicts. 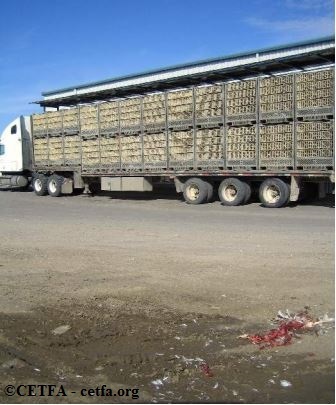 For more information about the slaughter of poultry, read CETFA’s report Broken Wings: The Breakdown of Animal Protection in the Transportation and Slaughter of Meat Poultry in Canada.